Adandora is a Bosmer scholar found tagging along with the outfit of misfits occupying the Crossroads Encampment in Craglorn. 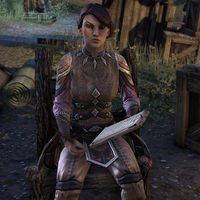 An aspiring writer, Adandora is currently reporting events of the Three Banner War in Cyrodiil, although she's struggling to find a publisher for her work, despite claiming to have connections in Wayrest. Her dream is to one day run her own newspaper and revolutionize journalism in Tamriel. She has also tried her hand at romantic fiction with a book entitled A Star Walks In Craglorn, which can be found lying on the crate next to her. Only a short snippet of this historical fiction can be read, detailing an encounter between an unnamed protagonist and The Celestial Warrior. "Everyone's got a story to tell and I'm here to listen." "A newcomer! Marvelous! Come in and tell me your story." "Hello there! Braving the Craglorn wilds? How exciting!" Are you a member of this group? You seem a little out of place. '"Do I? Oh dear. I do try to blend in, but this is so... well, "scruffy" isn't the word. "Rugged," maybe? Perhaps if I rub some mud on my face..."
So you're not one of them? "No, no. I'm simply along for the ride. I'm a writer, you see. I'm recording a truthful account of the war in Cyrodiil. None of the standing armies would have me, so I threw in my lot with Isrudde and her merry band"
"No? You don't think they're merry? I admit it might be a stretch, but you can't fault a writer for taking artistic liberties, can you?" "Entertain, mostly. I tell stories, sing songs, things like that. My singing is terrible, truth be told, but you know the saying... any port in a storm." "Well, to be honest, I think my real job involves listening. People are so desperate to be heard. They spend hours telling me about their childhoods, their dead pets, their various... um... conquests? I'm sort of the biographer in residence." Is any of it worth listening to? Kamjo told me a really fabulous story about how he killed an ogre with nothing but a jar of honey and a wooden spoon. But I'm fairly certain he was making it up. He doesn't know how to tie his own shoes." "Oh, this? It's a story about last week's battle for Fort Aleswell. Nasty business, but the people need to know what's going on in Cyrodiil! The truth must be told!" How will people see your story? "How will they...? Oh, you know. I have a few connections in Wayrest. There are lots of interested parties - buckets of them, in fact! I just need to work out the finer details. It's a complicated business, you know... getting your work published." "So it's not being published?" "Well, not at the moment, no. But one day soon, you're going to see my reports all over Tamriel! I even have a name for my journal: The Grahtwood Gazette! Catchy, isn't it? It's going to change the way heralds pass on the news, just you wait and see!"